Veteran monster truck driver Kreg Christensen brings years of experience and spectacular moments back to the Maximum Destruction® team. Christensen was a mud racer before building a monster truck and becoming one of the best-known and most popular stars in the western United States, behind the wheel of his unique Dragon Slayer. He made Dragon Slayer a major thorn in the sides of some of Advance Auto Parts Monster Jam®’s biggest stars. Having shown the best in the business how talented he was behind the wheel, Christensen was tabbed by Jimmy Creten to join the 2Xtreme Racing Team. He spent a year behind the wheel of Creten’s powerhouse Iron Outlaw truck. That was followed by one-year stints in Maximum Destruction® and Donkey Kong™. 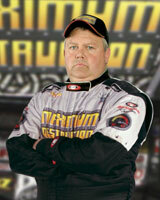 When a third Maximum Destruction truck was created to start the 2011 season, it was Christensen who was named to take over the wheel of the newest machine, which was sporting one of the most accomplished and popular names in the sport, Maximum Destruction. Q&A with Kreg Christensen MonsterJam.com: How did you get started competing on the Monster Jam circuit? Kreg Christensen: I mud raced on the Camel Mud and Monster tour for years, and then I bought a monster tank in 1992 and drove it for a year. After that, I bought a truck from Wyoming, rebuilt it, and created Dragon Slayer, which I raced in until 2007. From there, I drove Iron Outlaw in 2008, Maximum Destruction in 2009, Donkey Kong in 2010, and then back in Max-D in 2011. I’m really happy to be back in a Maximum Destruction truck that is really made to fit my needs. MonsterJam.com: What do you enjoy doing while on the road with Monster Jam? Kreg Christensen: I always enjoy meeting the fans, whether it’s on the road or in the airports. Monster Jam fans are like no other! MonsterJam.com: What do you do with your free time? Kreg Christensen: I spend time with my grandkids. It doesn’t matter if its playing ball, riding quads, or going to the movies, family time is always fun! MonsterJam.com: What is your greatest memory as a monster truck driver? Kreg Christensen: They’re all great memories, from big crashes to great saves. I don’t think one stands out as a greatest. MonsterJam.com: If you were not competing on the Monster Jam tour, what career path would you follow? Kreg Christensen: I’m a diesel mechanic by trade, but I would have liked to have been a shop teacher in high school or in a trade school. MonsterJam.com: What’s your favorite movie? Kreg Christensen: I like all types of drama, action, or romance. If I’m watching movies with my wife it makes those all favorites.